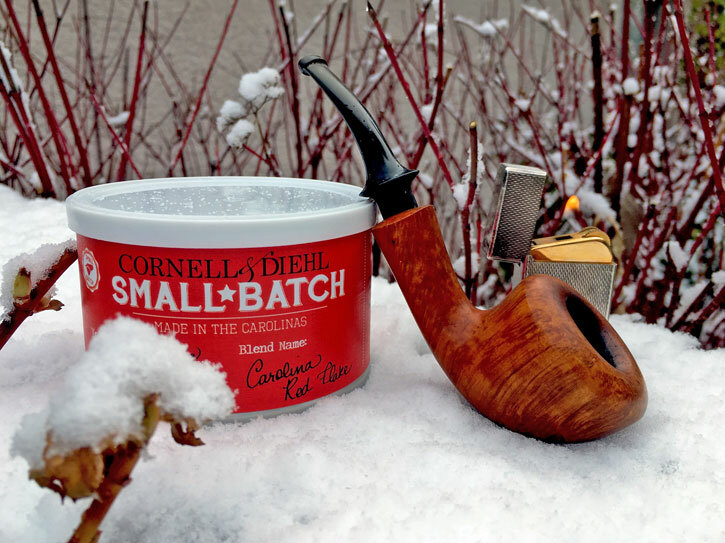 Almost like the spirit of the holidays, when the razor-edge scenarios between sanity and comfort swirl about like snow, reaching for a good smoke is essential. Red Virginia is one of my favorite of favorite tobaccos out there. It’s mellow, slow-burning, refreshing, not too acidic, not too sweet and not too meaty. Properly handled, it is a fantastic base for any mixture, especially when carrying the flavors of other tobaccos needs to be done with dignity. Red Virginia, I might say, is close to tobacco perfection–to make it sing requires a special hand to blend and a gentle approach to smoke. 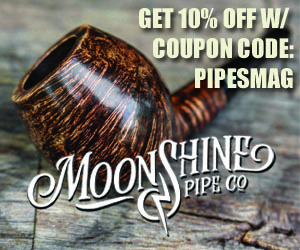 In my experience, any blend or mixture with a sizable helping of red Virginia tobacco doesn’t take kindly to seriously unkempt pipes and it will snarl a bit with serious rapid puffing. Snarling is part of the overall theme this time of year if things aren’t kept in check, so perhaps it would be a mindful and good companion. I don’t know about you, but 2018 has been a rough one, and I’ll be glad when it moves on, and I might as well do it with pleasure. 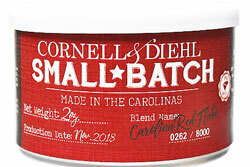 Cornell & Diehl has its Small Batch engines firing once again on another limited run. ”Carolina Red Flake,” you appear again for a second go-round. There was a previous review featuring another C&D Small Batch offering, “The Beast,” that I really enjoyed. In that same review I also tackled the timely notion that tobacco is being presented to us more and more in different ways. There’s a challenge being presented to the status quo–and criticize the marketing though I did, the moral of the story is, if it sounds good, get it, smoke it, and decide for yourself. Upon first glance Carolina Red Flake’s second incarnation slumbers in the tin, and reveals exactly what Red Virginia should look like–it’s not orange, it’s not yellow, it’s dappled shades of rust-colored leaf and what could only be described as “a ginger’s coif.” The cut-style is what I affectionately call a “lazy flake,” because they aren’t stiff little pieces of tobacco jerky that requires further cutting or mangling to get into good smoking form. It’d be a little harder to “roll and stuff” a pipe with this leaf. I eventually broke all of it up pretty good to a rough shag which in the end performed well. 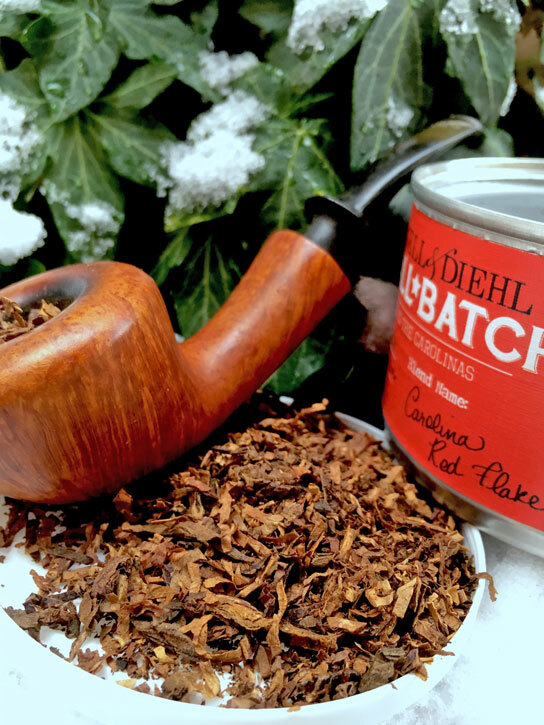 “Straightforward” is another claim the tin made, and that is well-deserved: it gives the smoker what I feel is a direct and honest experience of Red Virginia. The first lights are easy, as there isn’t the moisture content of its cousin, The Beast. I didn’t get any of the cranberry, orchard grass or citrus as the tin noted. I did, however, enjoy a slightly spicy and sweet paprika, tart apple with a roasted almond meatiness and mouth feel. In general, this is a very savory and herbaceous tobacco, with a little natural sweet on the side. There’s a pleasing garden-like freshness to the smoke, as opposed to a grassy, lemon-like or tart nature known to Red Virginia’s cousins, Yellow and Orange, and a signature reason why I enjoy it so much. 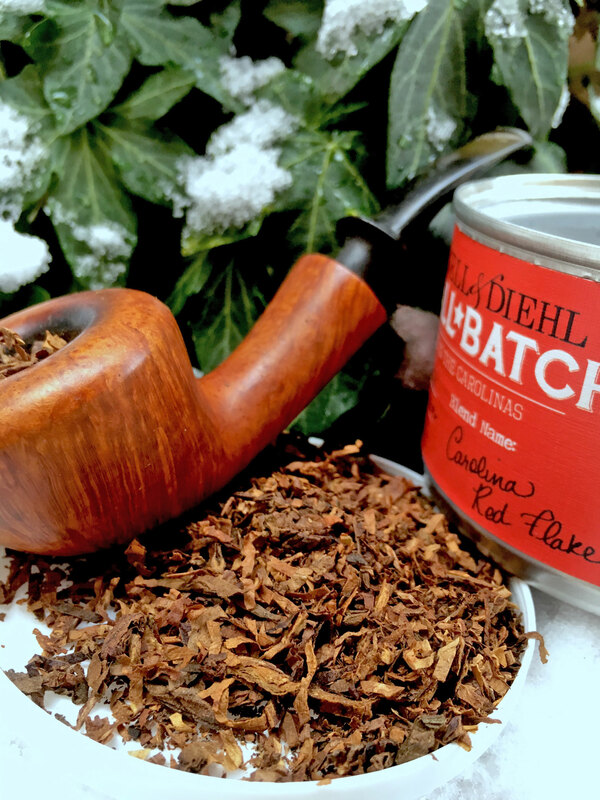 Carolina Red Flake is a “light-it-and-forget-it” kind of smoke and totally easy to manage. This is not a bold tobacco even if it is straightforward. The flavors I noted around curiously bounced around the halfway mark, depending on the pipe chosen and the portion chosen to smoke. I found myself sometimes hoping it would do just a little more. Slower smoking is the magic key to open up the experience here. It goes without saying it’s a more advanced tobacco, while aromatic guys will probably not be interested, the new guys might find it downright boring. Personally I found it intriguing. While the room note was suggested as “cigarette-like” to non-smokers, any pipe-appreciating bystanders expecting “grandad’s old pipe” scent around your Yule merriment might be disappointed. The nicotine levels are moderate but a few times I felt heavy in the chair. Toward the end of nearly every bowl the experience was as nice as the first light, if not a little more mellow. At this point, as with most Virginias, they can be a little dry on the palate…not quite unripe persimmon or mouthful of vermouth dry, but enough that having a beverage handy was a good idea. It may or may not dissuade any random hiccoughing. In Southeastern US fashion, some homemade sweet (but not too sweet!) tea was just about the perfect accompaniment one could have with it. If warm adult beverages chasing away the chills seems better, hot black coffee with a shot of bourbon is a wise choice. Nothing makes merry in my world quite like that. I do believe a little “cellar time” would do this tobacco wonders, especially to expose and separate those intricate complexities. Fresh out of the can, there’s a little sharpness to Carolina Red Flake that some might notice, but patience might be rewarded in a year, or two, or even if five went by. Alternately, if any buzz and limited availability about such tobaccos leave patience something to be desired, so be sure to experiment. Get two tins, smoke one now, forget about the other until it’s time. Perhaps “near perfect” is attainable for this leaf yet. Here’s hoping, and the second time’s a charm. Is this a near-perfect Red Virginia Flake? If we’re okay with the idea it is exclusively red Virginia, with a little mellowing time and the right approach, it may be. There has to be some balancing components other than simply Red Virginia leaf, but if there are, they aren’t overwhelming, and the end product is very good while fresh. It isn’t replacing my favorites in the genre, any claims of complexity aside, but it’s far from humdrum. While it lacks some of the depth and orchestral wonders of other Virginia-only blends I tend to reach for, the solo virtuoso (even duet?) nature of this small-batch Cornell & Diehl creation can be appreciated here without much complaint. These tins are likely to disappear sooner than later as the eager up-and-comers look to stuff their stockings or collectors grab a few extra to stuff their cellars. Happy Holidays, smoke well, enjoy you and yours in good health, Godspeed, keep sane, and see you next year. Lovely review, and very insightful. I’m digging the blend quite a lot myself. Also wondering what are the Virginia-only blends you typically reach for, esp. the ones with particular orchestral wonders. Sounds awesome! Thanks for the heads up, Kyle. Just added Embarcadero to my cart for future purchase. Good review; that said, I bought several tins of this with this last batch because I had heard so much about previous batches. I live in and around the area of North Carolina this batch came from…tobacco fields all around me (although I don’t know if any of those nearby actually supplied this batch). I agree with your assessment that it isn’t quite right yet and could use some aging, however, I have found a unique solution that you touched upon…’mixing’ it with another tobacco. What is unique about my solution is what I blended it with…and this is where I’ll probably get raked over the coals by many on this site. I mixed it with the OTC Carter Hall, which is mostly burley, and separately with Lane 1-Q which is a bulk aromatic that has a vanilla background. Then, I mixed all three…here is my assessment of the three blends. The two former mixes where actually quite nice, while the mix of all three left something to be desired. The only problem I found initially was the burn rate…Carter Hall and Lane burned far more quickly being ribbon cuts, but after I rubbed out the flake really well, it gave for a more even burn. Anyway, just my two cents for readers that may have tried this for the first time, with their reaction being “meh”. Thanks for a great review. As always, well written and nicely illustrated.